Last Sunday I went back to a church I hadn’t been to in about fifteen years. I grew up in this village, went to the primary school here, and was confirmed in this church. I was a member here for several years, and when I first lived in Japan I maintained my membership here. Even though I come back regularly, I stopped going to this church a long time ago, and for many years thought I would never go there again. For the last couple of years I have been to the parish church when I’ve been here, and for the record, never saw anyone from St. John’s there. About a year ago the parish priest retired, and during the interregnum there were no services at St. John’s. In January the new piest arrived, and now there are two services a month; on the second Sunday there’s a Eucharist, and on the third Sunday there’s a Family Service. About a fortnight ago I found the church’s Facebook page, and within a day was welcomed in a comment by Reverend Ian, who I believe is a non-stipendiary minister. I replied in a comment and explained my former connection with the church, which he apparently passed on to people at a joint service at another church on August 2nd. Through Facebook I was able to ask him about services at St. John’s and so found out that there was a Eucharist last Sunday. It seemed time to go back. I arrived a few minutes early and was greeted by Richard, who was the sidesperson that morning. I believe he’s also a member of the PCC and a church warden. He greeted me warmly, as did his wife, Diane. I sat between them during the service. I was also welcomed by Janice, Sue and Gaynor. I hadn’t seen them all in so long, I felt a bit sheepish and not deserving of so much affection after being away so long. The service should have started at 11am but was ten minutes late, because the priest, Reverend Andy, had to rush from the parish church after the 9:30 service there. There were between ten and fifteen people there. The service used a Family Communion booklet from Common Worship. The Peruvian Gloria was led with great gusto by Reverend Andy, Richard and Diane read the lessons. There was no organist, so we sang hymns accompanied by recordings of an organ. It felt a little odd to see the organ closed and not being used, because my father was the organist here for a number of years after he retired. It was good to be back, it was good to reflect on where I started my faith journey. As I worshipped last Sunday, in a church that used to be my home I realised how far I have come. I realised how much the shape of my faith has changed. A quarter of a century ago I set out on this journey and was most at home in this low church way of worshipping. Recently I have been noticing just how Anglo Catholic I have become. 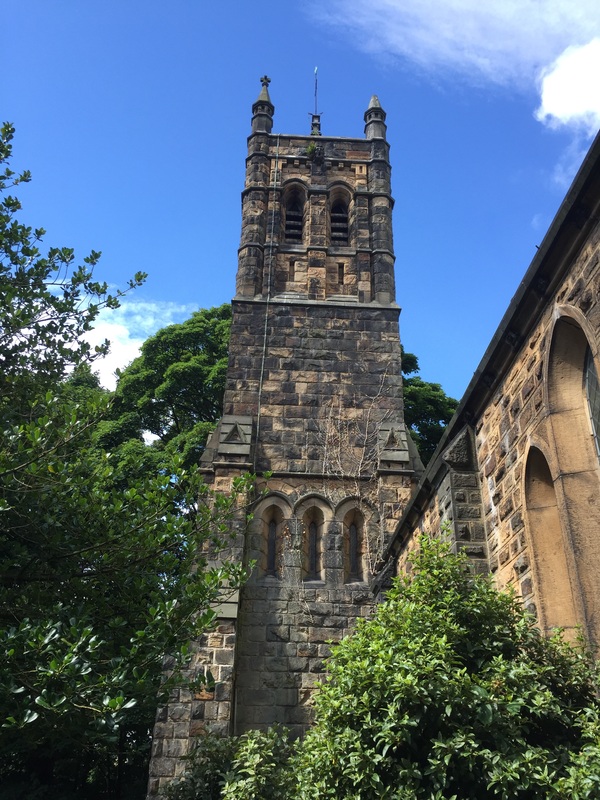 Last summer I blogged about the churches I visited and the services I attended and found myself reflecting on how visitors are welcomed, what I could learn about how my home church is. This summer I am turning it all back on myself, learning about what is going on for me and clarifying exactly where I find myself. Turns out I’m in an interesting place, and I’m wondering where I’m going to end up. It was humbling to go back to St. John’s and be welcomed so warmly when I had stayed away so long. And it was lovely to see this window again. 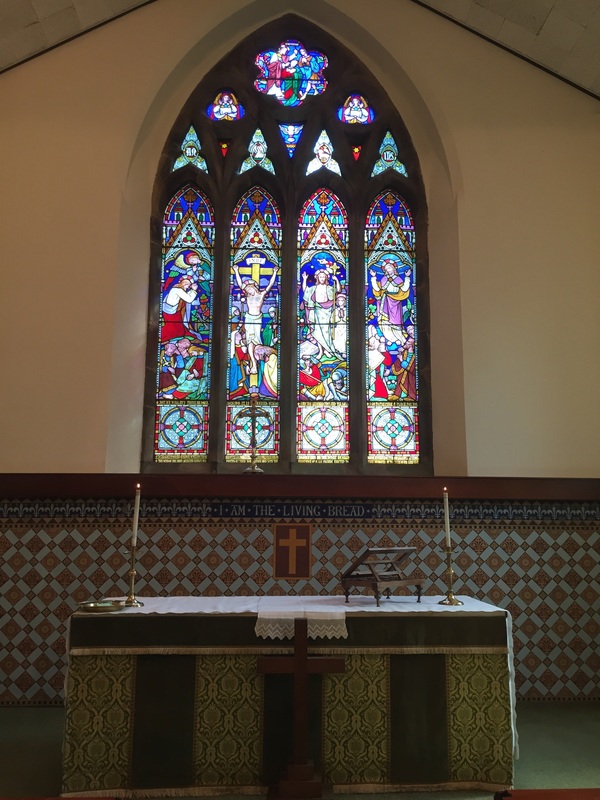 This entry was posted in Travel and tagged Anglo Catholic, Common Worship, Diane, Ephesians, Facebook, Family Communion, Gaynor, Janice, Peruvian Gloria, Reverend Andy, Reverend Ian, Richard, Ridgeway, St. John the Evangelist, Sue by tokyopurplegirl. Bookmark the permalink.